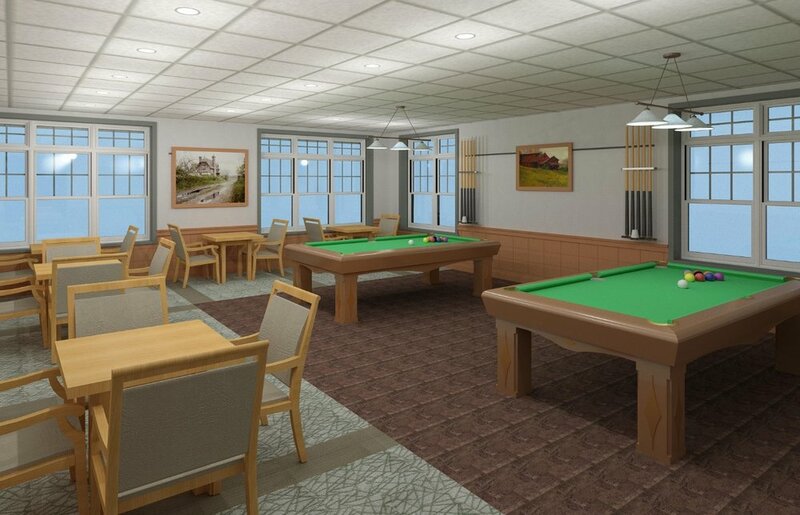 The 12,000 sq ft building is a dedicated, free-standing Senior Center, offering a new paradigm of intentionally-designed space to provide Wellesley’s seniors with opportunities for physical, intellectual, and social engagement. Informal drop-in areas/gathering spaces for spontaneous interaction and socializing…where anyone walking in will feel welcome and where seniors of all ages will gather…a place to sit and read, or engage in conversation. Spaces for scheduled activities and programs, including large and small multi-purpose activity rooms and a main hall…all designed for concurrent programming and maximum flexibility…places for learning, sharing, teaching, and contributing. Dining room that can be used for small and large gatherings, community events, special lunches, social activities, and more. Commercial kitchen to service the dining offerings and to enhance the dining experience. Outside patio area, with landscaping, benches, and a bocce court…places to be with others or just enjoy the outdoors. Office/administrative spaces providing welcoming and efficient office spaces for the COA staff. Space for confidential and private consultations. Through your generosity, the Tolles Parsons Center will be a beacon for Wellesley’s seniors for years to come. "This will be our seniors’ home away from home. They will take pride in it. They will treasure this."